This capo was found in an antique shop in Stockholm, Sweden. 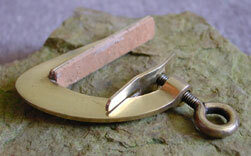 Cast brass with a glued on leather pad. 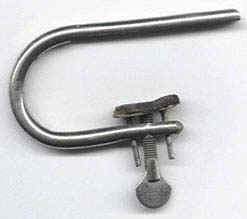 A steel spring rivited to the frame protects the back of the neck from the screw. There is no sign of any further neck protection on the spring. The beautiful and simple design makes this capo really stand out among the others on this page, but notice the similarity to the wooden capo further down. The next two capos were sold by Washburn and appeared in the 1889 catalog. The protection plate has two extensions to prevent it from turning. Padding seems to be compound cork. No patent. Next capo is most likely another Washburn capo. It's a combination of the two capos above. 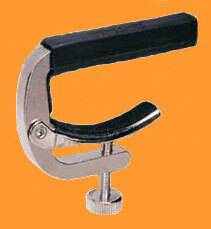 This brass capo is a combination of the two capos above in order to simplify production. Riveting the bar to the capo is faster than soldering it. 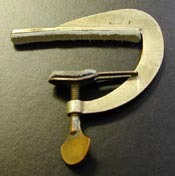 The design of the key with the hole is similar to the Washburn capo above. Moffat's Pat. Oct. 2, 1888. 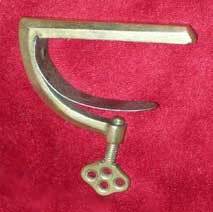 Since Washburn holds the patent for the hinged bar, I would say this is a Washburn capo from the 1890's or later. 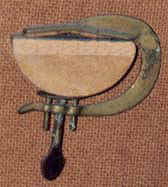 Brass capo with cork pad on the bar. There was a leather piece on the neck protection plate. Compared with the two Washburn capos below, this one could to be older. No patent. Brass capo. The leather pads are not original. For easier manufacturing the protection plate is extended to prevent it from turning. Since development tend to simplify things, I believe this capo is younger than the capo above. 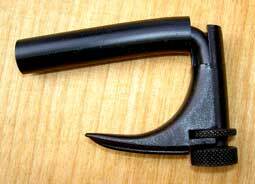 It is very similar to the Washburn capo below. No patent. 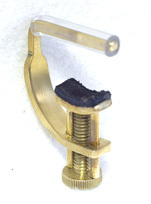 This German capo in mint condition is further simplified by making the screw out of one piece. This capo was reffered to as "French model", in the Schuster & Co (Germany) mailorder cathalogue from arond 1920. 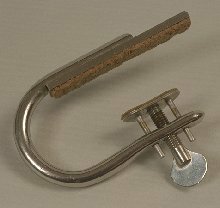 Nickel plated brass capo from the 1960's. Cork padding. Thin leather on the neck protection. 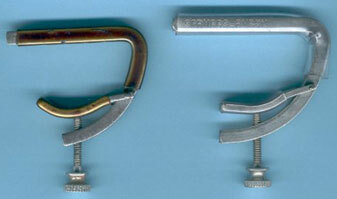 The screw attachment is similar to the older capos above. 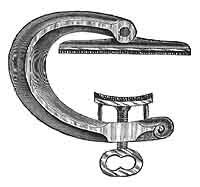 Compare with a yoke capo, probably from the same manufacturer. Very similar to the above capo, but it's simplyfied by grinding a flat surface for the pad (most likely cork) directly on the yoke. Probably from the 1950's. Stainless steel capo bought in Russia. 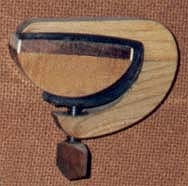 The upper part of the round yoke is flattened to hold the cork string pad. The neck pad is leather. Note the small peg through the end of the screw. Unknown capo. Note the unique hinge: The lever is stuck through the hole in the capo, then a stamp is used to reduce the opening so the lever will not fall out. You can see the mark of the stamp on the side of the capo. 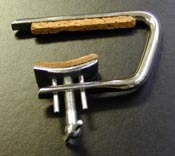 A similar capo from the early 1960's. Probably marketed by Targ & Dinner out of Chicago. Cork pad and clear plastic tubing. the 1960's by Jim Faulkner from Indianapolis. 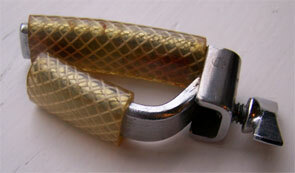 The rubber tubing was later changed for plastic (the older capo to the left). 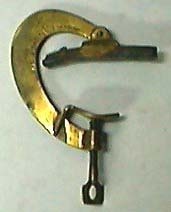 I bought this banjo capo in the 1970's. The plastic string protection is melted to the bar. Felt protection on the neck support. Here the rubber tubing is extended to protect the side of the instrument neck. Andy Smith was a fine workman in all materials. 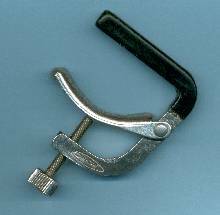 This plated steel capo was bought from him in 1970. Designed to be lined up against the top of the fret, thus avoiding retuning. Two parallel stripes of padding. One is lined up against the fret and the other is for damping the strings behind the fret. The bar has two small springy attachments to simplify the lineup against the fret. The protection plate is hinged in a slot for better adjustment to the neck. Made of extruded aluminum profiles. It has been out of production since the late 1980's. US patent 1978 by Doran M Oster. 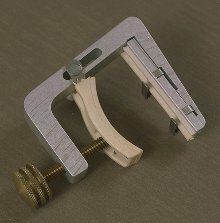 This banjo capo is also desigend to be lined up against the fret. 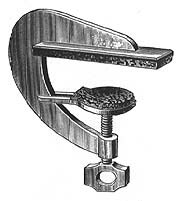 Striving for the tone of a nut, the bar of the capo has a bone edge. This capo was made in about 1993 but never did make it on the market. The capo was pretty clever though. It consists of only four parts and it is opened and closed by twisting the bottom jaw slightly. The picture shows the capo from the back side where you can see how the upper part of the bottom jaw is slotted so it can be twisted. Cast bronze with high-geared screw. Since the bronze is pretty soft, the curve of the bar can be adjusted to the curve of the fretboard. 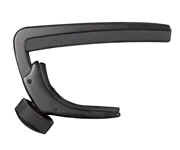 In 1999 the capo was redesigned. It looks very similar but the geometry is improved and the capo is slightly larger. The new model has VICTOR stamped on the bottom jaw. Victor also made a smaller model for banjo/mandolin. US patent 1992 by Frederick V Veenschoten. US design 2006 by Ned Steinberger. Aluminum profile with the screw placed on the outside of the side post. US design 1995 by H Milton Kyser. 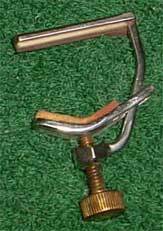 This brass rod capo with plastic tubing has a tall nut threaded upon the end of the extended bar to regulate the pressure. To prevent the screw from wearing through, the two guiding pins are extended to touch the head of the thumb wheel. Marketed by Janet Davis Acoustic Music.